Our friends John and Andrea have had a holiday home in Bordeaux for nine years. We had a standing invitation to go and visit them. And of course, we never did until they sold the place and we had one last chance to visit, which we did this weekend. Our friends Bob and Lynn took the overnight ferry from Portsmouth and drove down, picking us up from the airport en route. Friday night was a meal in; some wine was drunk. Saturday the weather forecast was pleasantly inaccurate and it was sunnier than predicted in the morning. Saturday morning, we went for a walk en famille. 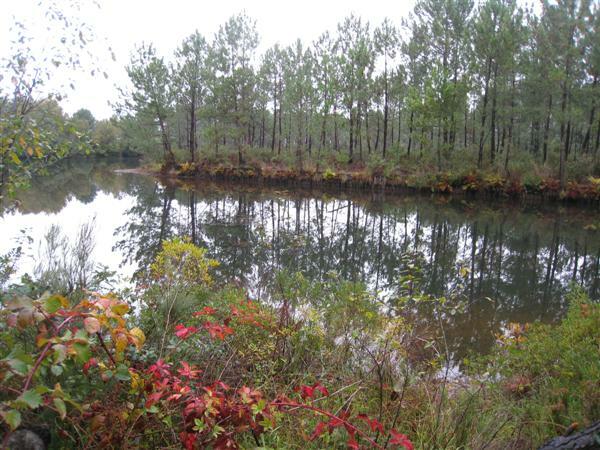 It was a lovely morning walking through pine woods, with views of the lake. 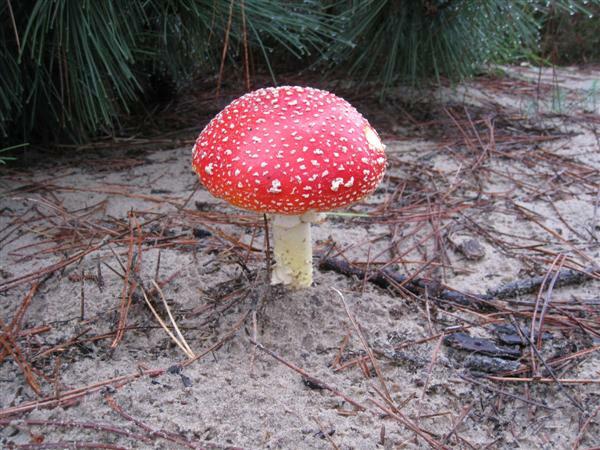 It being autumn and both warm and damp, the mushrooms were in full sprout. This one was simply missing the gnome. 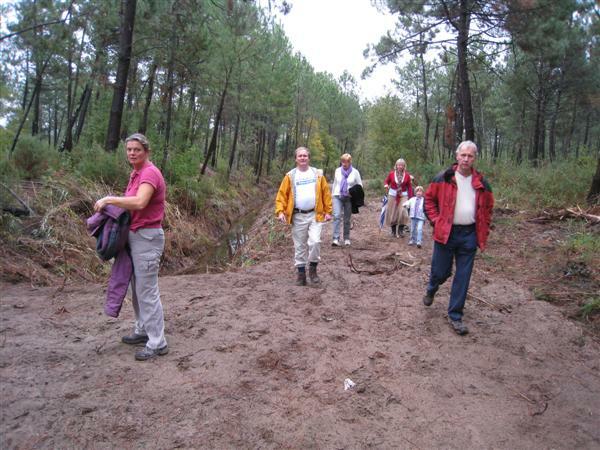 Mary, Andrea and the children went home and then shopping while John, Bob, Lynn and I did a nine kilometre walk to Lacanau-Ocean. We all met up at the coast for a lunch of crepe. 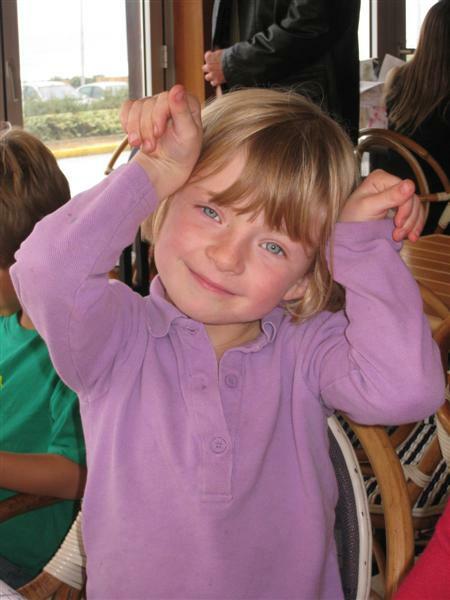 Charlotte was posing the camera. After lunch we drove the route du vin from Margaux to Loudon-Medoc going "Ooh, aah!" at the picture-book chateaux and bought some wine to go with the evening meal. Another meal in and even more wine was drunk, and possibly the guests as well - hic! 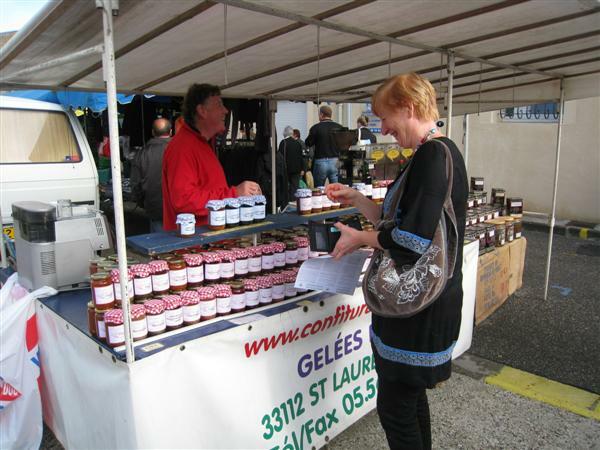 Sunday we went to the market at Castlenau where Mary bought some Sauterne Jelly. Excellent with fois gras and brie (French of course) so the stall holder informed us. 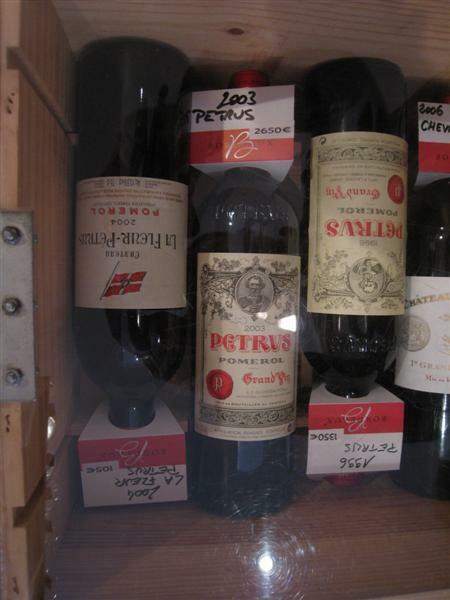 Chateau Petrus - a bargain at € 2650 a bottle (USD 2518)! Later we went to check out one of the local wine stores to peruse their shelves and marvel at some of the prices. Then lunch, back to the airport, back to the UK and home for a very early night. Steam Bar, the latest addition to the Wandsworth restaurant scene, is excelling itself. We had a superb wine tasting meal there last night. Arrived 7:30pm and left 11:00pm - the proper way to spend a relaxed evening meal. Kate did a fine job of presenting the wines and giving us some background to the winery. North island, East coast; middle tier family owned estate (not giant corporate, not garagiste), disused river bed with mix of gravel and alluvium giving a variety of terroir. The wines were fine but the chef surpassed himself and got a well deserved round of applause. Steam Wandsworth is hosting a wine makers dinner with the award winning CJ Pask winery in Hawke's Bay. guest and wine maker Kate Radburnd will be hosting a dinner featuring her wines. Kate's wines will be matched to a fantastic four course dinner, created by head chef William Leigh. Can't be arsed bothered to type up my notes. If you want to know about the wines I suggest you go to Steam Bar and drink them yourself - Cheers! with drop leaves on cabriole legs with pad feet. As previously blogged the house has been rearranged ("A Weekend with World-Class Wines") leaving us with no dining table. 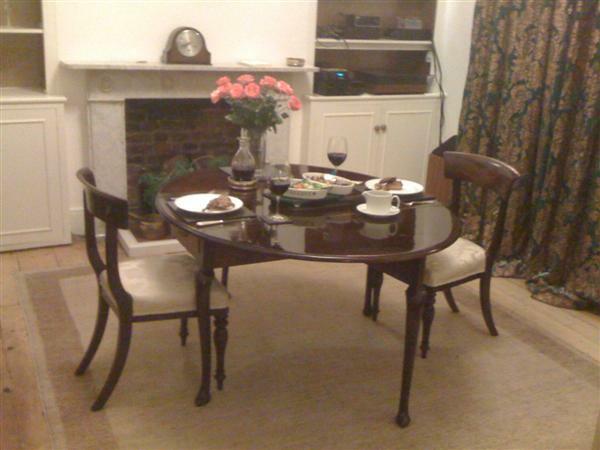 We looked at fine George III Mahogany dining table in Peter Jones where we bought the TV. A bargain at GBP 2,700 - not!! Instead we put in a bid at the local auction house (Criterion Riverside) for a table answering to exactly the same description. Maybe not in quite as superb condition but still a solid mahogany antique. Well pleased with that. So we christened it on Sunday with a fine Sunday evening meal of roast pheasant and a bottle of 1999 Baron de Boutisse Saint-Emilion Grande Cru. Monday night I went down to visit my long-time friend Ros in Epsom for a meal at the local Cafe Rouge followed by a concert at the Epsom Playhouse: T.Rextasy The Electric Boogie Tour! And a fine concert it was too; Danielz had them dancing in the aisles. This is the third time I have seen T.Rextasy. The first was back in 1997 at the Cambridge Corn Exchange, 30th September 1997 to commemorate the 20th anniversary of Mark's death. 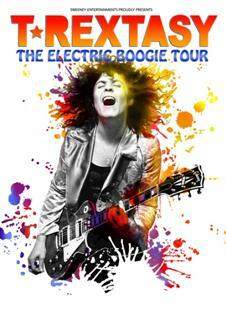 The second was Marc Bolan a Celebration at the shepherds Bush Empire to commemorate the 30th anniversary. This was the most enjoyable of the three for me. I think this is because of The London Bop 2009 where I realised that a tribute band is not simply trying to slavishly recreate the sound but give it their own interpretation as well. A fine evening, thank you Danielz. Sometimes I feel like Alice with the Red Queen running faster and faster merely to stand still. I normally quip on a Monday that I go to work to recover from the weekend unfortunately work is very busy too at the moment. This weekend was another hectic weekend. It started on Friday with meeting Mary straight from work at her hairdressers for a pre-theatre meal at Sofra followed by Bounce performing Insane in the Brain. A hip-hop dance performance based on One Flew Over the Cuckoo's Nest. Saturday was spent rearranging the house. Mary decided to turn the dining room into a cosy sitting room. It started with moving the sofa bed from the front room into the new sitting-room. That meant moving the bicycles from the dining room into the hall and the dining table into the study. That meant moving the computer desks into the back guest bedroom. It will take a few days for everything to be restored to order. Saturday evening, to relax, we went round the dinner to our friends Bron and Maggie. Bron, like Mary, is a wine aficionado and very generously produced some extremely fine wines from his cellar, two of which rated 100 out of 100 by Robert Parker. A rare treat and a very enjoyable evening. A beneficial side effect of the room rearrangement was that we had to go shopping for a second TV which meant a trip on Sunday to Peter Jones. We now have 37 inch LCD screen (Philips 37PFL5604H) which will be excellent for watching DVD's while Mary is watching rubbish on the other TV. We gave it a trial run Sunday evening with Moulin Rouge and very fine the new setup is especially with the sound played through Mary's hi-fi.